I believe that style is about showing your personality on the outside. You know - when you get an item of clothing and think “it’s just so me!” Most of us don't have one particular style, but many things we love which we put together to form a look that suits us and makes us happy. Some of us have spent so long trying to put together a wardrobe of clothes that actually fit that we have forgotten how to incorporate what we love. How many items in your wardrobe would you say you will still have in 10 years because you simply adore them? So often I ask women what fashion they like, and they haven't actually considered it! The focus needs to come off what we think we 'should wear' and get back to what actually brings us joy. Let's use me as a case study shall we? Thinking about your lifestyle and what you actually like is the first step. It sounds simple...have a go! You must consider your lifestyle, if you are super active incorporate that. If you work in an office or you're a stay at home Mum, use that to help inform your style choices too. - Navy is used as a base colour as often as black. You'll also notice I am usually on the more dressed up side - because that brings me joy. I don't really wear sneakers, clothing is more structured than relaxed, and even though I am most conscious of my tummy, I don't use a lot of long items to hide it - it's just not my style. You can read more about that here. If casual is your style, own it! Basics look fab if you bring the confidence to go with it. When you look comfortable, you look great. Also look for basics with details that give them a bit of interest, a pretty collar, a cold shoulder or a shaped hem. Keep to the ladylike silhouettes I love (Like Mindy from The Mindy project). Look for sleeves that fit, I won't be tempted into buying a batwing - it makes me feel frumpy! Add some great tops that will go with any pants, as a mum I wear jeans a lot at the moment - but since I'm not a jeans and tee gal, I prefer to wear a more dressed up top, or add a print scarf. I am desperately short on tops because they usually don't fit around my tummy if they fit around my bust - so I need to persevere in shopping for them. Because I'm a busy mum I stick to easy care light fabrics that can be put through the washing machine - silk is not on my radar right now - and shoes I can actually walk in hence the wedge/platform shoes. 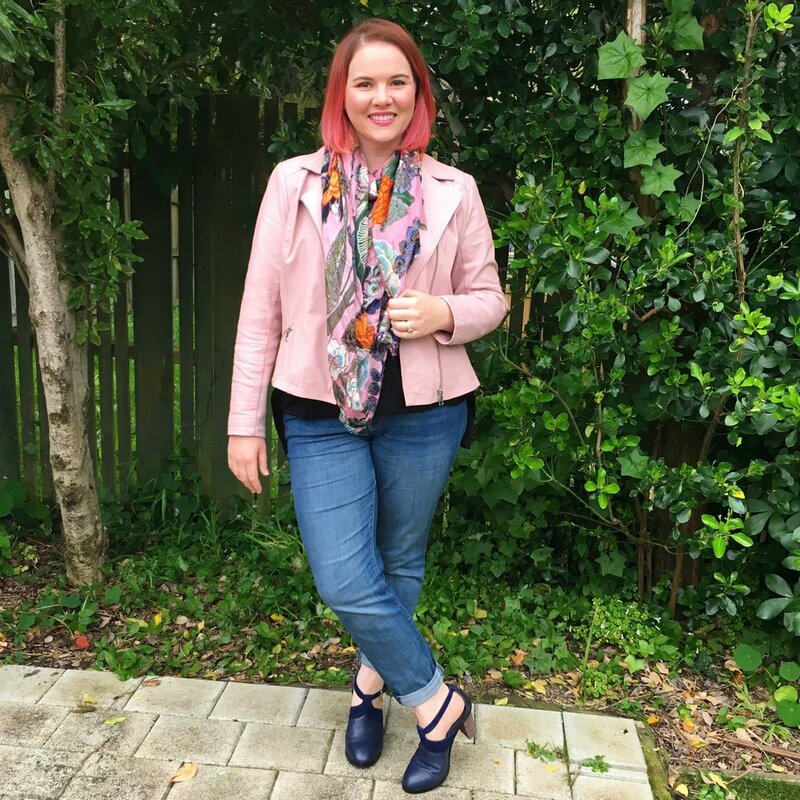 Using celebs/bloggers as your style crush and inspiration (like I do with Mindy Kaling) is a great idea, just make sure you are not actually comparing yourself to them, and adapt their style to suit YOUR lifestyle. Does your style reflect what you love and show your personality on the outside, or would you like to give it a boost? I'd love to hear your how you feel about your wardrobe!